This profit sharing calculator can be used to calculate the amount of net income to be shared as a bonus with employees. A startup business often pays a profit sharing bonus to its employees based on its net income for the year. A complication arises in the calculation of the profit share as the net income on which it is based needs to allow for the amount of the profit share itself and taxation. The profit sharing calculator allows a startup business to enter the profit share rate, tax rate, net income before profit share and tax, and a minimum net income which the business needs to operate, and then calculates the profit share bonus amount based on these inputs. The purpose of this profit sharing calculator is to calculate profit share to be paid to employees based on the input assumptions. Enter the profit share rate. The profit share rate is the percentage of net income that is to be allocated to employees. So for example if 25% of the net income is to be allocated as a bonus enter 25%. Enter the effective tax rate for the business. Enter the net income of the business before the profit share and taxation. Enter the minimum net income. The minimum net income is the amount of net income the business has decided it needs for operational reasons before considering paying any profit sharing bonus. So for example if the business decides that no profit sharing bonus is to be paid on the first 200,000 of net income, enter the amount of 200,000. 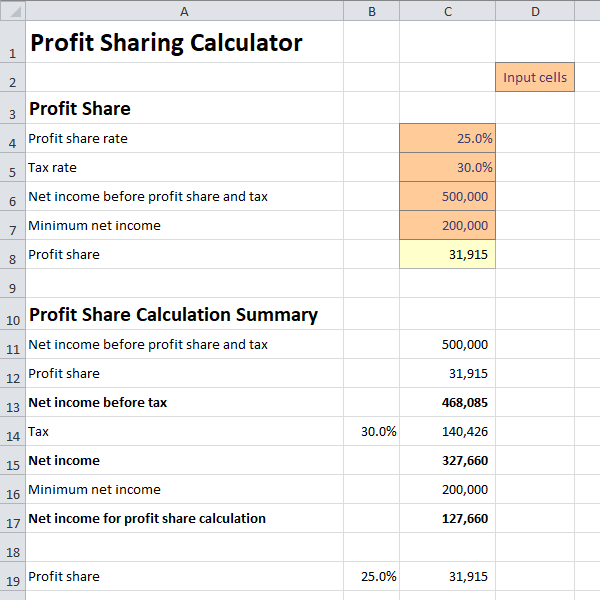 The profit sharing calculator calculates the amount of profit share bonus based on the input assumptions entered above. The calculator also sets out a summary showing the profit share included in the income statement, tax calculated after deduction of the profit share, and finally the calculation of the profit share itself after deduction of the minimum net income required by the business. The profit sharing calculator is available for download in Excel format by following the link below. Users use this profit sharing calculator at their own risk. We make no warranty or representation as to its accuracy and we are covered by the terms of our legal disclaimer, which you are deemed to have read. This is an example of a profit sharing scheme calculator template that you might use when preparing financial projections in Excel. It is purely illustrative of an incentive calculator. This is not intended to reflect general standards or targets for any particular company or sector. If you do spot a mistake in the profit sharing calculator, please let us know and we will try to fix it.